There are community banks and then there are banks that weave their way into the fiber of the communities they serve. Hatboro Federal is just such a bank. For more than 75 years, the bank that was born right here in the neighborhood has given back to the neighborhoods it serves in countless ways. With a focus on philanthropy that is directed towards education, Hatboro Federal has donated more than $1.3 million to local schools and organizations that strive to prepare our youth to be the leaders of tomorrow. To be kind. To be caring. To be creative. To be inventive. To make the world a better place. It’s who they are. It’s what they do. It’s what they believe in. In Centennial School District, Hatboro Federal’s EITC funding has supported STEM/STEAM-based programs that have boosted student interest and involvement in these disciplines. In Upper Moreland School District, Hatboro Federal supports the Middle School’s communications curriculum, by providing resources and materials that enable students to produce and edit informative and entertaining programming for the students, staff and the entire Upper Moreland community. Hatboro Federal continues to have an impact in Central Bucks School District by providing funding for innovative learning programs for students through CB Cares. Big Brothers Big Sisters of Bucks County has been able to expand its High School Bigs program, pairing area high school students as mentors to at-risk elementary school children. The program has shown significant improvements both academically and socially for the “Littles”, and increased their ability to avoid risky behavior. 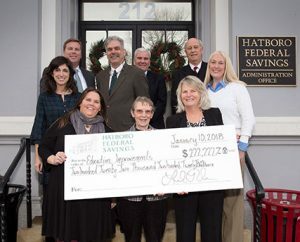 EITC program contributions from Hatboro Federal not only benefit the public schools in the neighborhoods Hatboro Federal serves, but they also support the Union Library of Hatboro by providing for books and other materials used to promote reading to the children of Hatboro. Educating, illuminating and empowering today’s youth to be tomorrow’s leaders – it’s a legacy that Hatboro Federal is proud to embody and share with the communities it serves. Making tomorrow better…today. Counter clockwise from bottom right: Hatboro Federal CEO/President Linda Roehner, Mary Gemmill of Union Library of Hatboro, Erin Simmons of Big Brothers/Big Sisters of Bucks County, Stephanie Yoder of Hatboro Horsham Educational Foundation, Dan Noble of Upper Moreland Educational Foundation, Rob Kutzik of College Settlement, Robert Philips and Bob Schrader of Centennial Educational Foundation, Kim Cambra of CB Cares.